← Thankyou for the trees! In 2008 consultants working for Transport for London (the UK’s Transport Research Laboratory and Living Streets) completed a report into road safety around King’s Cross. It was a detailed document describing the individual danger points throughout the area and giving recommendations for each. It warned that further road accidents were likely to occur should its findings not be acted upon. The report was never published and its findings were never acted upon. 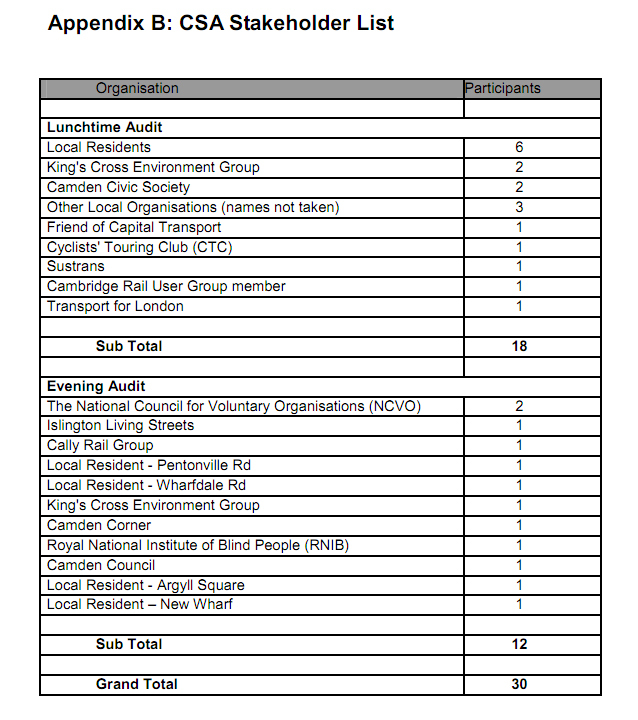 In 2009 consultants working for Transport for London (Colin Buchanan, recently merged with Sinclair Knight Merz) completed a report into road safety around King’s Cross. At no point did it reference the earlier report. It started by giving two options to TfL – a toss of the coin except that this coin was weighted. It concluded that the cheapest option which leaves the gyratory system with its current layout should be taken forward. The report has not been published and its findings are now being acted upon. The 2008 report consulted with 30 different organisations and individuals. Two of these could be said to have had a conflict of interest as they would have to pay for any changes made to the changes made to the traffic system. The 2009 report consulted with five different organisations and individuals. Three of these could be said to have had a conflict of interest as they would have to pay for any changes made to the traffic system. These reports continue the long history of studies, reports and research projects into traffic and road safety in King’s Cross. Have a look at the diagram in this article to get an idea of the complexity of these in recent years – and that diagram does not include everything. Combined with the number of accidents taking place here, and we are at much greater risk of collisions of any kind than is the norm in London, surely this gives a clear case for an imaginative, radical solution. Planners and transport specialists themselves must be frustrated at having to revisit this area time and time again. Bet they’d love to get their teeth into a real solution. London Cycling Campaign is now working on the ‘Go Dutch Campaign‘. Its principles maybe cycle centred, but taken as a whole they are an ideal start for making roads safe for each type of road user. It is this imaginative thinking we desperately need for King’s Cross. Central St Martin’s, University of the Arts London have joined the campaign. They moved to KX this term and are reeling from the effects of the hazardous traffic layout that is the KX gyratory. Please sign the online petition Central St Martin’s have set up to Go Dutch in KX. This entry was posted in Bad Gyrations KX Campaign, Road Safety in Kings Cross and tagged Central St Martins, Cycling, Gyratory, Road safety, TfL, University of the Arts, Walking. Bookmark the permalink. Beyond that sometimes between 2000 and 2003 just before it became defunct in its original make up Kings Cross Partnership, then situated at Wicklow Street also had a commissioned consultation with presentation on the gyratory system, advocating then to change its single lane lay out, mostly to two directional roads. Because KCP dissolved and the commission came about at the end of its existence it the findings of the consultation drowned with the dissolved organisation. I am sure though TFL and local authority where informed at the time. My question: Does anyone know where the records from old KCP are being archived. Not only would be interesting to see them but also it would pre-date the 2008 findings by at least an extra five years! 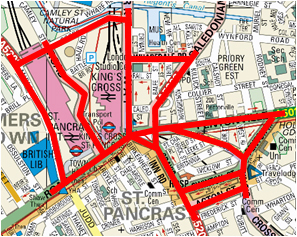 Daniel, The King’s Cross Partnership became the King’s Cross Community Development Trust, which went bankrupt in 2006. I can’t remember whether KCP had archived anything before it changed into the Trust, but after the Trust went belly up the redoubtable (and much missed) Lisa Pontecorvo did a ‘rescue dig’ (by agreement with the loss adjusters) and you should find what she saved in the London Metropolitan Archives. That, by the way, is always a good place to start looking for KX material, because so many KX groups work cross-border in both Camden and Islington, and the practice has grown up over the last ten years or so of giving LMA stuff as they’re London-wide.